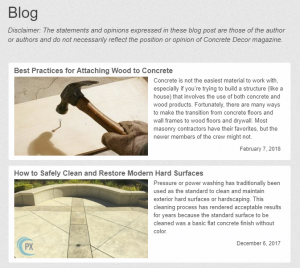 The Concrete Decor Blog is a powerful online environment where leadership thoughts and insightful commentary are shared by many of the industry’s recognized business leaders, contractors, artisans and trainers. Make sure your company’s banner ad is found online at www.ConcreteDecor.net so that your company is never more than a click away from this ultimate on-demand reference for decorative concrete professionals. For details, please call (877) 935-8906 and ask to speak with your Account Manager.